See what's happening around town with this listing of club and organization meetings, as well as ongoing events. 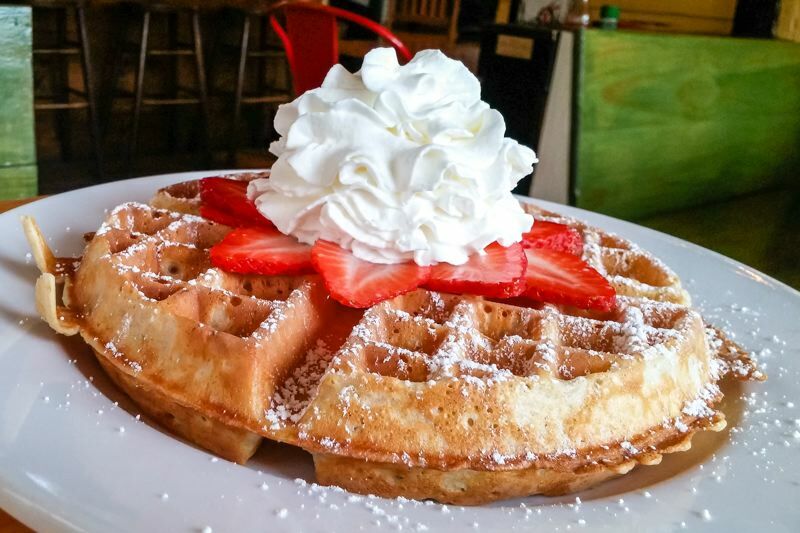 • Strawberry Waffle Breakfast — 8 a.m. to 1 p.m. Sunday, June 10, Boring-Damascus Grange Hall, 27861 S.E. Grange St., Boring. Annual event benefits the grange and includes raffle bingo, Goat Poop Bingo and homemade Belgium waffles with local strawberries, served by area politicians. Tickets are $8 for adults, $36 for groups of six people. Children under age 6 are free. • Volunteer Info Session — 3-4 p.m. Monday, June 11, Gresham Library, 385 N.W. Miller Ave. Metropolitan Family Service will present a variety of volunteer opportunities to enrich the lives of youth and older adults in the community. • Bingo — doors open at 5 p.m. every Thursday night, Gresham Elks Lodge No. 1805, 3330 N.E. Division St. Early bird games start at 6:30 p.m., followed by regular games at 7 p.m. For more information, call the Elks at 503-666-1805. • Zimmerman Heritage Farm — noon to 4 p.m. third Saturday of each month at 17111 N.E. Sandy Blvd., Gresham. New exhibit features quilts from the 1850s to the 1930s. Admission is $5 for seniors, $7 for adults; free to ECHO members and children under age 13. More information, visit echohistory.org. • Heslin House Museum and Historic Jail — noon to 4 p.m. third Saturday of each month at 60 Main St., Fairview. New exhibit features posters and other memorabilia focused on the home front during World War II. Admission is free to ECHO members and Fairview residents; $2 for all others. More information, visit echohistory.org. • Harlow House Museum —1-4 p.m. Sundays, 726 E. Historic Columbia River Highway, Troutdale. • King of Roads Exhibit — 9 a.m. to 4 p.m. Monday through Saturday, and 1-4 p.m. Sunday, Troutdale Historical Society Barn Exhibit Hall, 732 E. Historic Columbia River Highway, Troutdale. For more information, call the Troutdale Historical Society at 503-661-2164. • Exotic Bird Meet and Greet — noon to 2:30 p.m. third Saturday of each month, Petco, 12020 S.E. Division St., Portland. Sponsored by the Exotic Bird Rescue of Oregon. • Interfaith Vigil for Peace and Tolerance — 6:30-7:30 p.m. first Tuesday of each month, Gresham Library, 385 N.W. Miller Ave. All are welcome. Sponsored by the Baha'i Faith of Gresham. • Rotary Club of Gresham — noon, Wednesdays, M & M Restaurant and Lounge, 137 N. Main Ave., Gresham. • Rockwood Kiwanis Club — 12:10 p.m. Wednesdays, Abby's Pizza, 21255 S.E. Stark St., Gresham. For more information, call 503-740-3541. • Prime Timers Dining Club — 6 p.m. Wednesday, June 6, M & M Restaurant and Lounge, 137 N. Main Ave., Gresham. For more information, visit wwwPrimeTimersDiningClub.com or call Pat at 503-936-5861. • Rotary of the West Columbia Gorge — 7:30 a.m. Thursdays, Mt. Hood Room, McMenamins Edgefield, 2126 S.W. Halsey St., Troutdale. • Gresham Breakfast Lions Club — 6:45 a.m. Thursdays, M & M Restaurant and Lounge, 137 N. Main Ave. For more information, contact Leonard Kirk at 907-748-8699. • Soroptimist International of Gresham — noon, first, second and third Thursday of every month, Gresham Elks Lodge, 3330 N.E. Division St.
• Gresham Kiwanis Earlyrisers — 7 a.m. Fridays, M & M Restaurant and Lounge, 137 N. Main Ave. Gresham. • Country Cut-Ups Square Dance Club — 7-10:30 p.m. first, fourth and fifth Saturday nights, 13987 S.E. Richey Road, Boring. For more information, call Marc at 503-502-8478. • Sandy Chapter, NW Steelheaders — 7-9 p.m. first Wednesday of each month, Sam Cox Building, Glenn Otto Community Park, 1102 E. Historic Columbia River Highway, Troutdale. Guests welcome. For more information, contact Steve Rothenbucher at 503-257-0039. • Kiwanis Club of Damascus-Happy Valley — 7-8 a.m. Wednesdays, PUB212 and Restaurant, 20400 S.E. Highway 212, Damascus. • Kiwanis Club of Clackamas-Happy Valley — 6-7 p.m. third Wednesday of each month, McCools Pub & Grill, 12066 S.E. Sunnyside Road, Clackamas. • Kiwanis Club of the Columbia Gorge, Troutdale, Corbett — 6 p.m. first Thursday of each month, Gresham Honda, 24999 S.E. Stark St. More info, www.columbiagorgekiwanis.org. • Baby Boomers Social Club — 7-10:30 p.m. third Saturday of each month, Gresham Elks Lodge, 3330 N.E. Division St. Join others born between 1946 and 1964 for dancing and socializing. Cost is $8 for members, $12 for non-members and $8 for first timers. More info, visit www.babyboomerssocialclub.com. • Troutdale Citizen's Advisory Committee — 7 p.m. Wednesday, June 6, Kellogg Room, Police Community Center Building, 234 S.W. Kendall Court. • NEMCCA — 9:30 a.m. Wednesday, June 6, Corbett Fire Hall, 36930 E. Historic Columbia River Highway. • East Multnomah County Soil and Water Conservation District Personnel Committee — 10:30 a.m. Tuesday, June 12, district office, 5211 N. Williams Ave., Portland. • Troutdale Planning Commission — 7 p.m. third Wednesday; Kellogg Room, Police Community Center Building, 234 S.W. Kendall Court. • Gresham City Council — 6-8 p.m. first Tuesday; 3-5 p.m. third Tuesday; Gresham City Hall Council Chambers, 1333 N.W. Eastman Parkway. • Fairview City Council — 6:30-9 p.m. first Wednesday; 7-9 p.m. third Wednesday; Fairview City Hall Council Chambers, 1300 N.E. Village St.
• Wood Village City Council — 6 p.m. second Tuesday; Wood Village City Hall Council Chambers, 2055 N.E. 238th Drive. • Troutdale City Council — 7 p.m. second and fourth Tuesday; Troutdale City Hall Council Chambers, 219 E. Historic Columbia River Highway. • Alzheimer's Caregiver Support Group — 10-11:30 a.m. second Thursday of each month, Gresham Senior Center, 600 N.E. Eighth St.
• Alzheimer's/Dementia Caregiver's Support — 1-2:30 p.m. fourth Wednesday of each month, Trinity Lutheran Church, 507 W. Powell Blvd., Gresham. For more information, contact Jeanette Vice at 503-666-4305. • PACT — 7-8:30 p.m. second and fourth Tuesday of each month, First Baptist Church, 224 W. Powell Blvd., Gresham. For more information, call Gary Swoboda at 503-810-1441. • Grief Support — 2-3:30 p.m. Mondays, Trinity Lutheran Church, 507 W. Powell Blvd., Gresham. Sponsored by Mt. Hood Hospice. No charge, but registration is required. For more information, call Cindy Johnson at 503-668-5545. • Overeaters Anonymous — 10:30-11:30 a.m. Wednesdays, St. Henry Catholic Church Parish Hall, Room 7, 346 N.E. First St., Gresham. For more information, call Margie at 253-222-5654. • Taking Off Pounds Sensibly (TOPS) — Gresham Chapter 0983, 6 p.m. Tuesdays, Clear Creek Church, 4100 S.E. 182nd Ave., Gresham. Doors open at 5 p.m. For more information, call Nancy at 503-761-1566. • Taking Off Pounds Sensibly (TOPS) — Gresham Chapter 0905, 7:45-8:45 a.m. Wednesdays, Gresham Manor, 2895 S.E. Powell Valley Road. Doors open at 7 a.m. For more information, call Virginia at 503-753-5133.